Briardale Cottage Self-cateringThis charming stone-built cottage is one of six in a short, early 20thC terrace set in a little cul-de-sac close to the centre of Ambleside and handy for all the village amenities. Briardale Cottage has been designed to accommodate two in comfort. There is no need to use the car on a daily basis - plenty of walks, for all abilities, start from the door, including the famous Fairfield Horseshoe, which rises to almost three thousand feet just beyond the village. Other walks include Loughrigg Fell, Wansfell and Todd Crag, whilst there are easy valley rambles to Grasmere, The Rydal Round and beyond or to the lake for cruises in any season. Ambleside offers a fine choice of places to eat, pubs, cinema and daytime facilities including tennis, bowls and mini-golf making this a year-round destination. 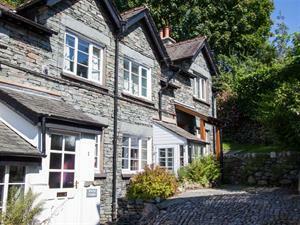 This charming stone-built cottage is one of six in a short, early 20thC terrace set in a little cul-de-sac close to the centre of Ambleside and handy for all the village amenities. Briardale Cottage offers weekly bookings starting on Saturday. Briardale Cotta offers weekly bookings starting on Saturday.